Less than a mile east of where the present Chelsea is located, Otter Creek Station once existed. By the end of 1861, the Chicago, Iowa, and Nebraska Railroad, later known as the Chicago and Northwestern, had extended westward that far into Iowa. When Otter Creek Station was moved about three-quarters of a mile west to the present location of Chelsea, and the railroad extended westward, the name was changed. One story has it that S.G. Breese, one of the original owners of land near the site, named it for Chelsea, MA, from where he had emigrated. Another is that John I. Blair named it for Chelsea, England. In the history of Chelsea, floods have often played havoc with the town and its environs but its citizens return and carry on the tradition of hardiness. 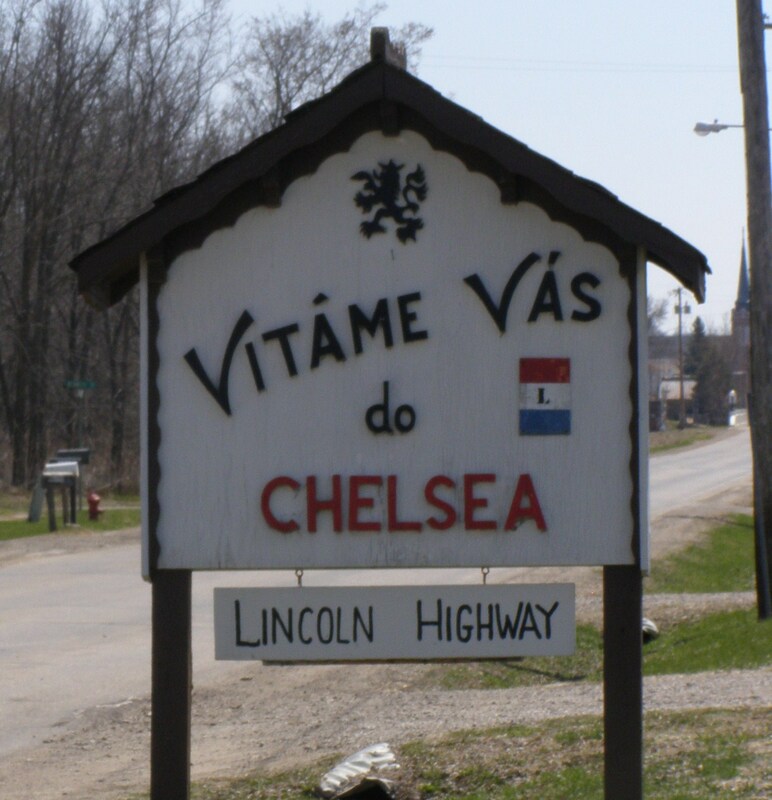 Chelsea lies along the original Lincoln Highway route which was America’s first “coast-to-coast” highway. The original steel bridge on the Lincoln Highway in Chelsea was replaced in 1928-29 with the Otter Creek Bridge, which in turn had to be replaced in 2007. Citizens of Chelsea encouraged the preservation of the lamp posts which graced the old bridge railings. That action brought high accolades from the National Lincoln Highway Association. I was doing some research on my family roots. My great,great grandparents came to Iowa from Pilsen,Bohemia. Their names were Albert & Anna Hach. My great grandfather planted a vineyard in Chelsea. He came from Prague, Bohemia. Last name Zeman. Moved on to Colorado when Iowa went dry. There is too many Zemans that went through that area that trying to find anything about them is hard. Chelsea was made famous too by citizen L. Sheda, who for years operated a fur buying business in town. People would come from all over the Midwest to sell their furs to “Ludy”. It was a different time – and one I sorely miss. Does anyone have any information on the former Dohnalek residence in Chelsea. There were originally 2 houses on the plot and one was torn down and the other moved to it’s present site. Have tried to find pics of the plot before 1925 but to no avail. Would appreciate any info that could be found. I am looking for information on Frank Smaha (3 Oct 1884-December 1973). He came from Bohemia to Iowa in 1910 and settled in Chelsea where he died. It appears he was a single man. My paternal line is Smaha but this Smaha is not connected to my tree and would like to find out more. Does anyone have any information, obit, etc? Thanks so much!